The truth is simple enough. We live in an interesting time. There are so many glaring problems screaming to be solved and yet we see so much distraction. They come in all sorts of forms and different shapes. There are controversies created simply to keep us busy. There are outrageous political statements being dropped to take away our focus from what really matters. There is one saga after another to sidetrack our focus. But then that’s just clever politicking for you. You manipulative politicians will always come up with all sorts of ridiculous ways to divert attention from what really is going on. The aim of course is to confuse, to muddy the water. The more confused people become the better it will be for their selfish purposes. In Samoa today, sometimes it pays to step back and look in from the outside. It allows you to put things in perspective. Your vision becomes a lot clearer, your hearing takes on a different level of sharpness and then you see as clear as daylight what is happening. And what is that you might ask us? The problem for Samoa today is that there is a false sense of security. People think they are okay. They are swayed by these big impressive developments which they don’t need and the sweet talk. The reality is that they are suffering. There is an emptiness; there is a big void you can see in people’s eyes. They are desperate. And they need help. From our standpoint, sad to say, we see a government that doesn’t care. But then how can it care when it is desperate? What time does it have to be compassionate when it is clutching at straws to try and fix a mess it has singlehandedly created by recklessness and abuse? The fact is this; everything happening today in Samoa, from talks about taxing the clergy, redefining the role of the sa’o in families, pulenu’u, customary land consultations, to the review of taxes and charges, opportunities for employment overseas and more are geared towards paying a foreign debt created by this government that has ballooned uncontrollably over the years. And there really are no winners, as we have said time and time again. Neither critics nor the government of the day can claim a victory of any sort in this matter. There are only losers and that involves you, me and everyone else in this country who will end up having to fork out to pay for it. That includes our children, their children, their children’s children and the thousands of unborn Samoans who will inherit the legacy of debt the current crop of leaders are piling up for them to clean up. The reality is; give the current leadership another 15 years or even less to continue their defiance and they will pass on eventually. At six feet under, they wouldn’t have to worry about anything. The worst part is they cannot be held accountable then. And many of us might not even be around then when the chickens come home to roost. It is the future generations of this country who will suffer. They are the ones we should be concerned about. 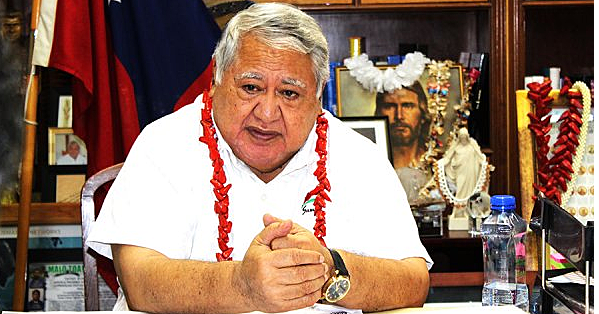 The real issue for Samoa is excessive borrowing and this government’s inability to control spending, which has forced them to continue to borrow way beyond what we can afford. We’re talking about the leakages in finances created by corruption, collusion, abuse of power and public properties that has cost this country millions of tala. Over the years, we’ve seen how this menace called corruption has been allowed to fester so that today it looks incurable. And it’s not just the major instances of wrong-doing that are alarming. It’s the small things that add up. It involves the blatant abuse of public properties such as the practice of pimped-up government vehicles heading to the farm with loads of talo shoots and gallons of water in the middle of the afternoon of a weekday while workers at some Ministry are driving rental vehicles to do the work. It’s the abuse of government fuel, maintenance costs and the dishonesty in collecting revenue that is hindering development. It is about the public service misusing the internet, printers, phones and basic equipment during work hours – and even after work hours. And then there is the reckless spending by certain Cabinet Ministers in buildings that end up becoming white elephants, draining millions of tala that could have been better spent. We could go on and on but you get our drift. Despite the assurances from the government that there is no reason to panic, we believe there is. For starters, the government just hasn’t shown that it has the ability to improve income and revenue generation. Secondly, it has failed miserably in its bid to try to attract foreign investments, which are vital to create much-needed employment opportunities. That’s on top of multiple failed investments in buildings and infrastructure that end up costing more to maintain. And here’s the one that’s going to really hurt. We hear that an increase in V.A.G.S.T. is on the horizon. As if people are not suffering enough. Have a safe Friday Samoa, God bless!